The Seattle Seahawks took a trip to the Windy City where they battled the Chicago Bears at Soldier Field on Monday Night Football in Week 2. It wasn’t always pretty. In fact, there were some ugly moments from both teams. But some players really shined under the spotlight of the prime-time, national audience, making a big statement in the process. In the end, the Bears walked away with a hard-fought victory, 24-17. These are the biggest winners and losers from the Monday Night Football action. The Legion of Boom is a thing of the past, but if Shaquill Griffin continues to make plays like he did Monday night in Chicago the Seahawks will have something to build on going forward. The second-year cornerback picked Mitch Trubisky’s pocket twice in the first half. The second was all effort and athleticism as he went horizontal and picked the pass almost off the turf to force the turnover. Griffin finished the night with four solo tackles, three passes defensed and the two picks. In seasons past, Wilson has been able to get by playing behind an awful offensive line. In fact, he’s actually thrived. But part of that had to do with having players he could count on to gain separation in space and give him a chance when plays broke down. Doug Baldwin is out right now with a knee injury, and he’s not going go be healthy all year, even if/when he does return. Paul Richardson is now playing in Washington with Alex Smith. Jimmy Graham is currently loving life playing with Aaron Rodgers in Green Bay. Tyler Lockett isn’t the guy, despite what the Seahawks paid him recently on a new contract. He’s a complementary player, and the touchdown he caught Monday night was all about that Russell Wilson throw. Brandon Marshall is well past his prime and only makes effective plays when Wilson is allowed to throw on time — a rarity right now. All this to say, Wilson is all alone on an island, and there doesn’t seem to be any help coming soon. For the second week in a row, Chicago’s front seven has been nightmare fuel for the opposing offense. And while the entire unit is solid, the addition of Khalil Mack has turned it into a juggernaut. Sure, Seattle’s offensive line is awful (we’ll chat more about that in a bit). But Mack and Co. were absolutely dominant on Monday night. As Mack and rookie Roquan Smith begin to get more integrated into this front seven, it will become even more dangerous in the coming weeks. That’s a scary thought for the rest of the league. On one hand, we understand that it was always going to be practically impossible to dial up a gameplan that allowed the Seahawks to consistently win. Chicago’s front seven against Seattle’s offensive line just wasn’t a fair matchup to begin with. With that being said, the way Brian Schottenheimer abandoned the run so quickly in this game was a disgrace. Chris Carson gained 13 yards on his first three carries and the Seahawks were moving the ball well on the game’s opening drive. Then he went away from Carson — who only had three carries the rest of the night — and Russell Wilson started getting annihilated by Khalil Mack and Co.
Schottenheimer said in the lead-up to this game that he’d be emphasizing the run more this week. That materialized in the second half somewhat, but it was Rashaad Penny being featured instead of Carson. Not surprisingly the Seahawks floundered badly on offense all night long. Chicago’s decision to throw big money at Allen Robinson in free agency is bearing immediate fruit. He caught four passes for 61 yards against Green Bay in Week 1 before becoming the featured pass-catcher for Mitch Trubisky on Monday night. Catching 10 passes for 83 yards, he was all over the place gashing Seattle’s defensive secondary. The one thing we’re interested to see going forward is whether he becomes more of a deep threat like he was during his tenure with Jacksonville. So far he’s been more of a possession receiver in Chicago, but we know he’s capable of doing much, much more. 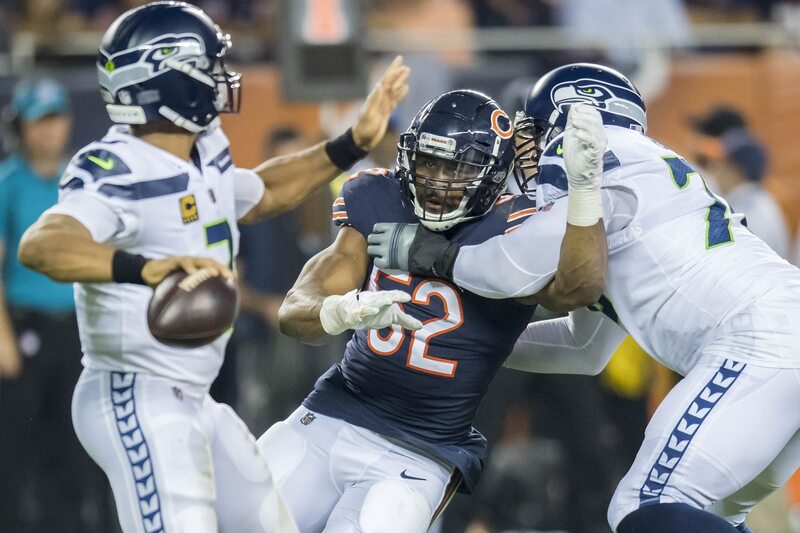 The Bears racked up six sacks, seven quarterback hits, seven tackles behind the line and held Seattle’s running game to just 3.4 yards per carry. This is just a continuation of what we witnessed last weekend in Denver, when the Broncos had their way with Seattle’s Swiss cheese offensive line. It’s also a continuation of something that’s been going on the better part of a half a decade. The Seahawks have continually neglected to protect their franchise quarterback, making the job of stockpiling offensive linemen a secondary concern. Now, Wilson is paying for it in a big way. And so is the entire offense. The Seahawks had a real chance to make this game very interesting in the fourth quarter. They were driving near midfield when Russell Wilson finally made a big mistake. He stared down his receiver, and cornerback Prince Amukamara was on the prowl, baiting the quarterback. Once Wilson let go of the ball, Amukamara pounced. He picked off the pass and went 49 yards to the house (watch here). This gave Chicago a two-touchdown cushion, which proved necessary as Wilson inevitably led a fourth-quarter touchdown-scoring drive to give his team a puncher’s chance at the end. For the most part, Mitch Trubisky wasn’t under a lot of pressure on Monday night. He was sacked twice — once by Frank Clark and once by a blitzing Mychal Kendricks. Those were the only two hits he took all night long. Seattle used to feature one of the most intimidating front sevens in the league. Multiple injuries to linebackers Bobby Wagner and K.J. Wright have made it tough to do much in the way of effective blitzing recently, and the front four isn’t doing a good job of applying pressure on its own. Combined with the team’s struggles on offense, it’s no wonder the Seahawks are off to an 0-2 start to open the 2018 season. Sebastian Janikowski only got one chance to boot the ball on Monday night. But when his number was called he showed he’s still got the leg to make big-time, long-distance kicks. Right before halftime, he drilled a 56-yarder to finally give the Seahawks some points heading into the locker room.